Matt's cousin Chris made some lemon white chocolate popcorn a while back. Her family loved it, but she said it was a little hard to make. She sent the recipe and suggested we try it. Chris's suggestions have all been winners so far. Her baked General Tso's Chicken was delicious and her healthy pumpkin ice cream didn't make it through the day. So, I knew I had to make this recipe as well. I altered the directions a bit and used vanilla chips instead of white chocolate. The results were delicious. It was sweet with just enough citrus kick. Just be careful though, we were eating it outside on hot day so it didn't take the coating long to soften back up. This would be a perfect switch up for a family movie night. An unexpected treat that everyone will love! Zest the lemon and reserve zest for later. Cut the lemon in half and squeeze each half into separate dishes for later. Melt vanilla baking chips in small bowl in microwave. Start with a 30 second interval, then stir. Continue microwaving in 15 second bursts, stirring after each until it is smooth. Stir zest into melted chips. 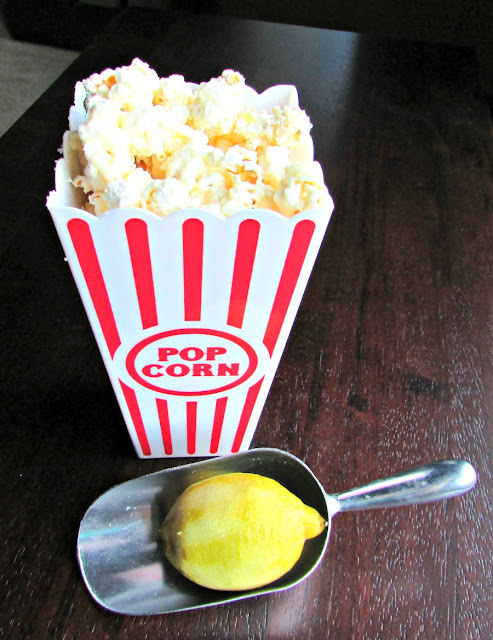 Quickly pour over popcorn and stir to coat. 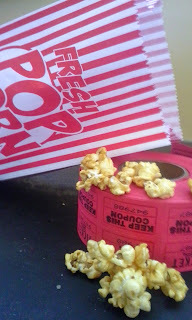 Spread popcorn over a sheet of parchment or wax paper. 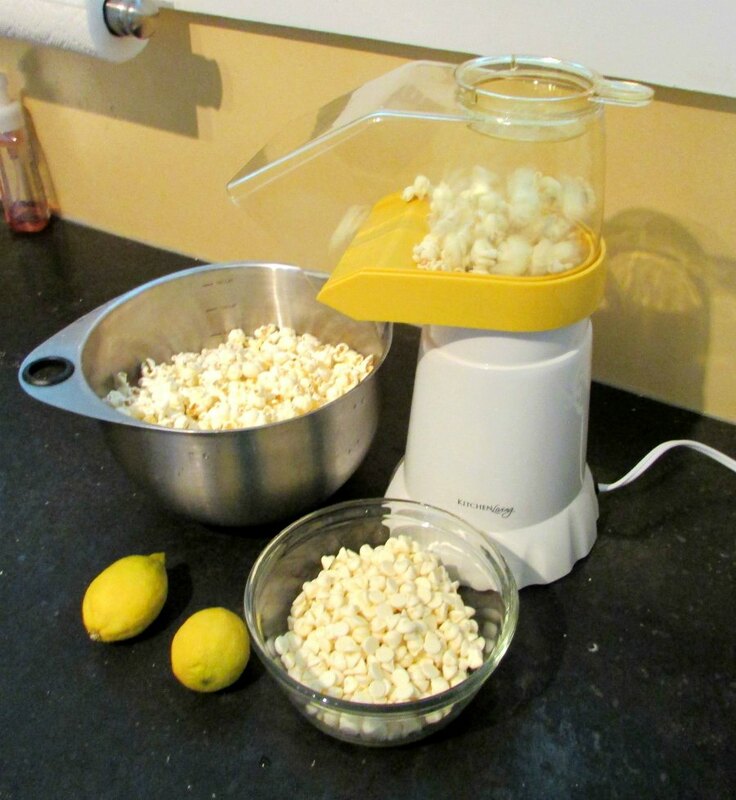 Drizzle one dish of lemon juice over popcorn and let sit for at least 30 minutes. 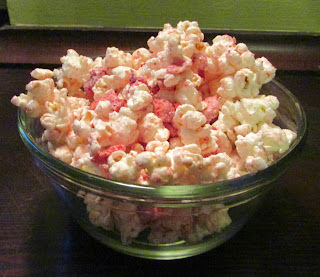 Drizzle remaining juice over popcorn and let sit for another 30 minutes. I'm a fan of caramel corn and hot buttered kettle corn! When did my sweet tooth get involved? Ha! My sweet tooth is always involved! This sounds so unique - and yummy! I will be trying it for our next movie night! It was fun to try something a little different! Ooooo....mmmm lemon! Always love lemons in summer. Thanks for sharing! Me too! A little citrus splash is always welcomed when it is hot outside. Thanks for stopping by! Wow! Sounds scrumptious! Pinning this one for sure. My Grands LOVE popcorn. Thanks for sharing at the Merry Monday party. We love popcorn too! My little guy asks for it all the time (he thinks pizza and popcorn is an acceptable daily occurrence!) It is such a fun and versatile snack.